The QBPM range of beam position monitors are capable of providing a beam position accuracy of less than 2 microns. QBPM technology is based on an array of 4 large area photodiodes to capture solid angle fluorescence from scintillating foil. The use of different foils allows the QBPM to be used over a range of energies. This concept is licensed from Argonne National Laboratory and base of design work carried out by R.W. Alkire, G Rosenbaum and G. Evans. The High Vacuum Quadrant Beam Position Monitor (HV QBPM) is designed for monochromatic X-rays focused to an experimental station. Coupling this device with one of our 4-channel current amplifiers provides a beam positional accuracy of less than 5 microns. The system has pneumatic foil insertion to allow the scintillation foil to be moved in and out of the beam as required. For ease of installation the system comes in 3 standard configurations; KF40, KF50 and BPC. We also have adapters available to convert from KF40 to BPC (Male or Female). 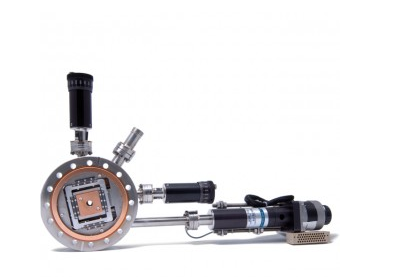 All UHV systems have an stepper driven foil changer; the foil changer can house two scintillation foils allowing different foils to be used for the photon emission optimisation of a varying beam intensity. 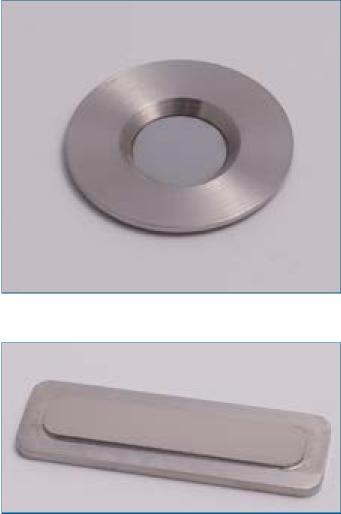 We also offer a Dual Beam Position Monitor (DBPM) to provide vertical positioning on Bending Magnet Beamlines. The DBPM uses an array of diodes mounted above and below the beam which provides vertical positional feedback. The position of the array within the conflat can be moved vertically via a micrometer. The foil holder position can be adjusted via a stepper motor. 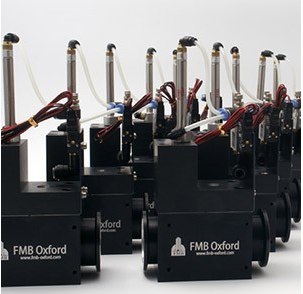 FMB Oxford offer a range of foil materials and thicknesses suitable for use with the diode array beam position monitors. The table below provides a guide for selecting the appropriate foils. Speak to us if you require a foil not listed. When selecting foils we recommend adding .5 keV to the Kα1 emissions to ensure a detectable signal.